“My soul proclaims the greatness of the Lord; my spirit rejoices in God my savior,” (Luke 1:46-47). Our parishes are blessed to have three strong women as our pillars. 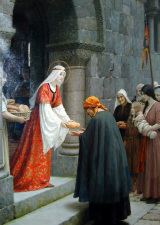 St. Therese, St. Elizabeth of Hungary, and Mary Most Holy, pray for our parishioners and our community! “Mary Most Holy goes on being the loving consoler of those touched by the many physical and moral sorrows which afflict and torment humanity. She knows our sorrows and our pains, because she too suffered, from Bethlehem to Calvary. 'And thy soul too a sword shall pierce.' Mary is our Spiritual Mother, and the mother always understands her children and consoles them in their troubles. Then, she has that specific mission to love us, received from Jesus on the Cross, to love us only and always, so as to save us! 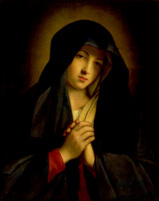 Mary consoles us above all by pointing out the Crucified One and Paradise to us!” (1980).